With so many crossbows to choose from finding the right one for you can be confusing. If you are looking for a high performance crossbow at an affordable price, then maybe this review of the Barnett Jackal can help you make the right decision. The Jackal crossbow comes with a sturdy build and is designed to produce fast and powerful shots. Accurate at distances up to 40 feet or more, this affordable Barnett compound crossbow might be exactly what you are looking for. The crossbow’s build will help determine its performance rate, and you want it to be sturdy and well balanced. The materials used to construct the limbs should be durable and able to provide plenty of support, and you also want the bow to be easy to aim and draw. The Barnett Jackal comes with a sturdy build that starts with the quad style limbs. Designed to provide stability and support so you can easily make accurate shots. The energy wheels at the end of the limbs ensures a smooth and powerful draw, while the attached cable system produces incredibly fast arrow speeds. The lightweight construction of the bow helps to ensure comfort, and can also prevent arm fatigue that might cause your hands to shake and throw your aim off. The lightweight design also makes this crossbow an excellent choice for children and adults. One of the first aspects you’ll notice is the sleek stock, which features a military inspired design. Not only does the stock add a nice touch to the crossbow’s appearance, it also gives you a comfortable and safe place to grip. The fore grip is divided for extra comfort, and it can also help you maintain correct hand placement. Not only will this keep your hands safely below the path of the string and arrow, but it can also help improve the accuracy of your shots. The lightweight 7.7 pound design also makes the crossbow easy to carry to your favorite hunting spot, and with a 12 inch power stroke it can be used by almost anyone. The Jackal crossbow is also designed with a picatinny rail which will help guide your shot to the target. Safety is always a concern with Barnett’s engineers and this is reflected in the Jackal’s design. The 3.5 pound trigger is easy to pull, but it is also “crisp” enough to prevent accidental misfires. You will also appreciate the traditional camouflage design that makes it easy to blend into your surroundings. What truly sets this crossbow apart is its high performance capabilities that make it an excellent choice for target shooters and hunters. The combination of the quad limbs, high energy wheels and cable system allows the bow to easily produce arrow speeds up to 315 feet per second. With a draw weight of 150 pounds and 95 FP of kinetic energy behind each shot, you can easily and humanely take down most types of North American game. 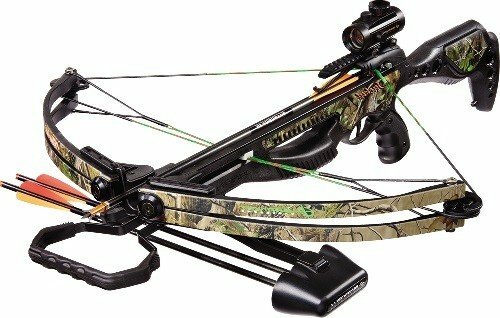 Along with providing you with a fast and powerful performance, this crossbow is also extremely accurate. The picatinny rail guides provides a convenient platform to mount the arrow and help ensure an accurate aim. The well balanced design ensures straight shots, and the 3.5 trigger pulls smoothly to prevent any jerky movements that might throw your aim off. Everything you need to start hunting right out of the box is included with the Jackal crossbow. The included instructions will walk you through the simple set up steps, and the crossbow can usually be assembled in minutes. As an added advantage all of the necessary bolts and screws are included with the crossbow, along with a convenient set of hex keys. The accurate scope is pre sighted up to 20 yards for your convenience, and it is also easy to adjust as needed. The included quiver ensures that your arrows are always close by, and it also includes three 20 inch bolts so you can get started immediately. You will also appreciate the included 5 year warranty that will give you additional peace of mind. If you are looking for an easy to use crossbow that is fast, powerful and accurate, the Barnett Jackal might be just what you need. Manufactured by one of the leading companies in the industry and designed by top engineers, there really isn’t anything not to like about this powerful crossbow. The quad limbs provide plenty of stability and support, without adding any weight. The energy wheels and efficient cable system ensures a fast and powerful shot that can penetrate almost any target. While ranges will vary according to skill and set ups, this compound bow will easily handle most legal large and small game. Perfect for adults and children, this crossbow can also help you become a better archer.